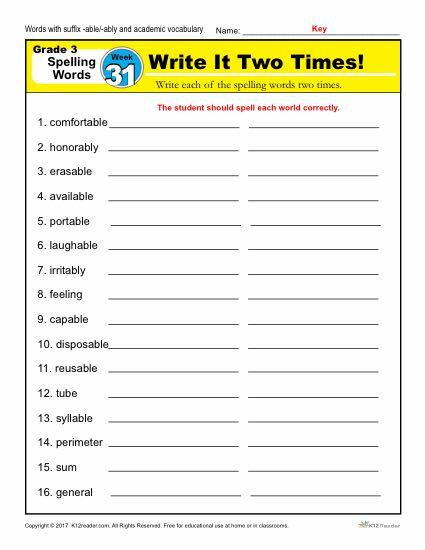 The 3rd grade spelling words for week 31 is made up of 16 words that include the suffix -able/-ably and academic vocabulary. There are 5 activities to help students master the words: Write it Two Times activity, Circle the Correct Spelling activity, dictation sentences where the teacher/parent says the sentence and the student writes it, Fill in the Blank activity, and Write the Missing Letter Worksheet. Spelling words include: comfortable, honorably, erasable, available, portable, laughable, irritably, feeling, capable, disposable, reusable, tube, syllable, perimeter, sum, general. This week’s spelling list is part of our free 36 week 3rd grade spelling program. This week’s spelling list is part of our free 36 week 3rd grade spelling program.